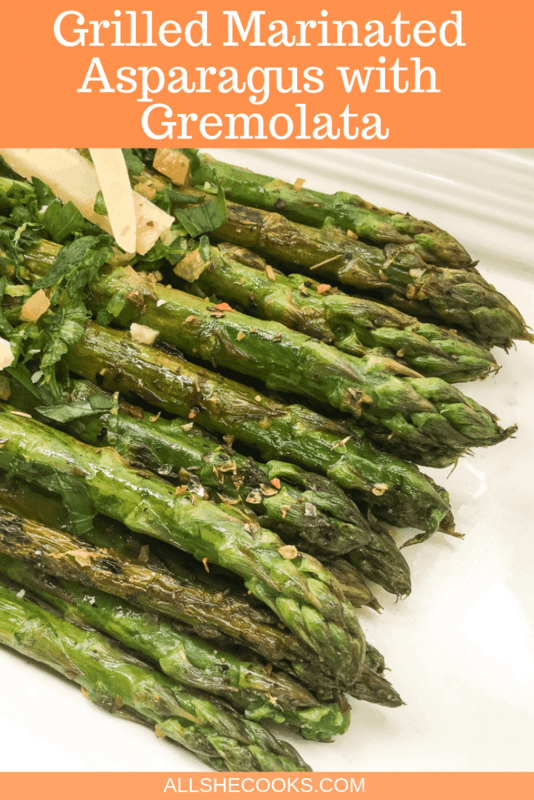 Grilled Marinated Asparagus with Gremolata is a quick and easy side dish that is enhanced by the addition of a simple, yet tasty, Italian gremolata. For me, asparagus is synonymous with spring. And when fresh, green tender asparagus spears are at their peak, there is nothing better than a simple preparation that lets their freshness shine. This recipe for Grilled Marinated Asparagus does just that. Fresh and flavorful asparagus is grilled to perfection and topped with an aromatic trifecta of parsley, garlic and lemon zest. So bright and fresh, it’s like pure sunshine on a plate! Traditionally, gremolata consists of just three ingredients: fresh parsley, garlic and lemon zest. Gremolata is used to top meat, poultry, and seafood. Here, a bit of preserved lemon rind is added for an additional pop of flavor. Place asparagus in a wide, shallow bowl and drizzle with olive oil and balsamic vinegar. Season with Mediterranean-spiced sea salt and black pepper, to taste. Gently toss to combine and set aside for 15-20 minutes to marinade. Prepare the gremolata by combining all ingredients is a small bowl. Season with salt and black pepper to taste, and set aside. Spray grill grates with non-stick cooking spray and preheat grill to medium-high. Place asparagus and lemon halves over direct heat and grill for 3-4 minutes per side, or until they are crisp tender. Tip: For easier turning (and to prevent asparagus from falling through the grill grates), thread two pre-soaked wooden skewers through several spears lined upside by side to hold them together. 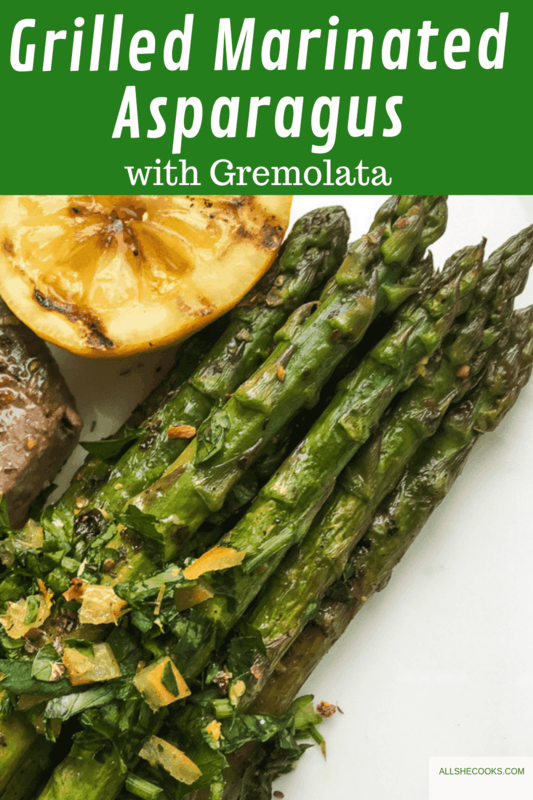 If you love this Grilled Marinated Asparagus with Gremolata, then you’ll want to try this delectable Mediterranean Roasted Vegetables, my Orange-Glazed Salmon with Asparagus, and this Instant Pot Asparagus Parmesan Frittata. 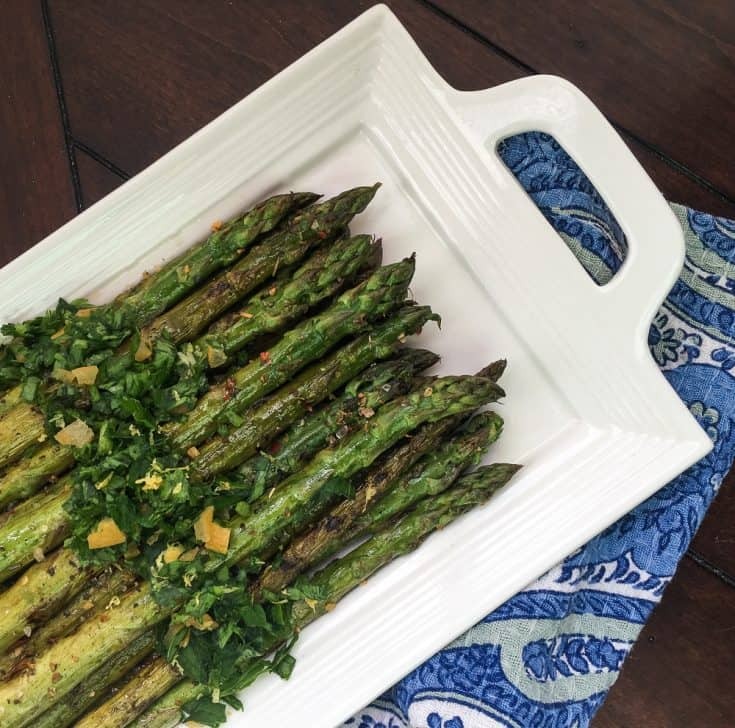 Grilled Marinated Asparagus with Gremolata is a perfect springtime side dish.